Boy, April, you've been a doozy real life-wise. Between administrative headaches at work and a surprise week-long cold in the middle of the month, you've left me itching for a vacation. Good thing I'll be going to Chicago in May for a wedding (and, hopefully, to meet Julianne!). Book life-wise, April's been decent. The month brought me a strange mix of 3-star and 5-star reads; I felt like I was either pleased but vaguely underwhelmed or shouting from the rooftops. All things considered, being thrilled by 1/3 of your books ain't too shabby. Fun fact: Tell the Wolves I'm Home is the book that finally got me to attend my local book club meeting (you know, the one I've only meant to attend for the last 22 months. Oops). It's also the first book that's made me cry in a very, very long time. I keep meaning to write a review or other post about it, but the words still aren't coming to me. I hope to get around to it soon. I posted a couple of reviews, including one for Loving Day (due out on May 26!). I also shared a few thoughts about Hausfrau and rounded up some of the most thoughtful writing I found on the novel. It's short, but it packed a devastating punch. 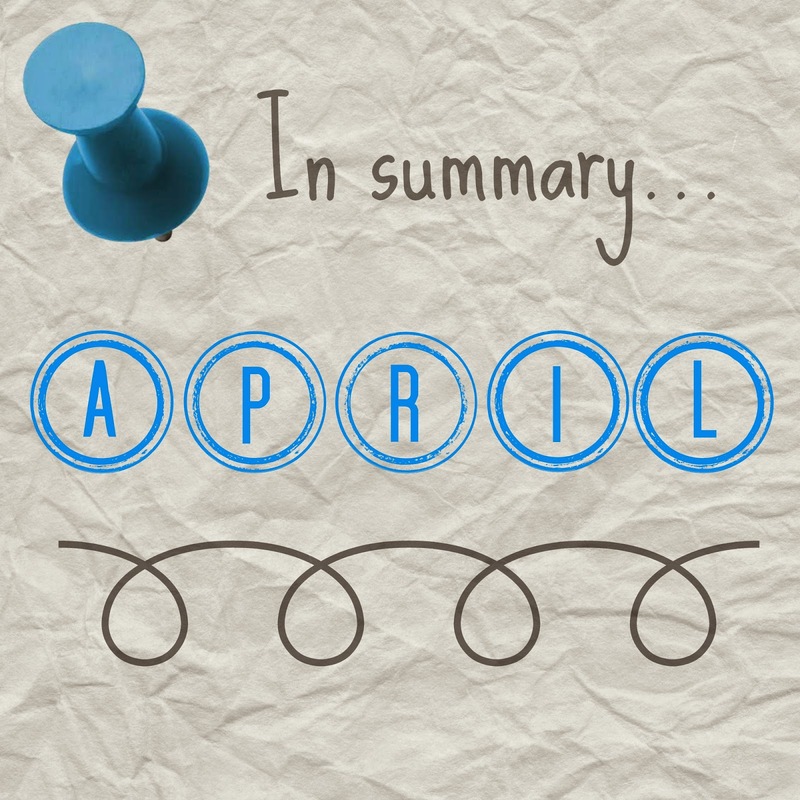 Finally, April was all about the reading challenges! I participated in the #ReadingMyLibrary challenge hosted by Stefani of Caught Read Handed and Amy of Read What I Like. I finished a total of five library books this month and saved $64.42 while doing it! You can check out my weekly updates here, if you're so inclined: Week 1, Week 2, Week 3, Week 4. Oh, and Dewey's. We can't forget about Dewey's. This was my first time participating in the readathon since I began blogging. I felt much better prepared for it, and going into it with friends at the ready made it an even more wonderful experience. I can't wait until October to do it all again! In May, I want to focus more on non-fiction. My stack has been full of fantastic stories lately, but I want to get back to my science, history and social justice reads. On the docket so far are In The Garden of Beasts: Love, Terror and an American Family in Hitler's Berlin by Erik Larson and Chasing the Scream: The First and Last Days of the War on Drugs by Johann Hari. Anything I should add? Tell me about your April! Did you read anything wonderful? I look forward to your Potato Peel thoughts! I just wish the ending had felt a little less rushed. It can be hard to let those 5-stars perk up a so-so month, but you're right about 1/3 being great! So glad you read Tell The Wolves...it's such a great book. I think I'm about to enter a good nonfiction binge, too. I have Krakauer's Missoula waiting for me at the library and I've been itching to pick up Ghettoside. Isn't it?? I was floored by it. The ladies at my book club were less impressed, but hmph, I say! Oooh, I had my eye on Ghettoside when it was a Goodreads giveaway book but haven't checked if my library has it. I hope you enjoy Missoula—it sounds like it would instantly set my blood boiling. Yep, 1/3 is good. If there's 5 stars in with lower ones then it's all good. I didn't know it was your first readathon; glad you enjoyed it! I had a so-so reading month but I started The House On The Strand which I'm loving. Yay! Did you like it? (Have I asked you this yet?) I hope to write something about it soon... even beyond the great historical and social context, Marjane is such a fantastic character. Ah, so glad that you're kicking off May to a strong start! Sorry to hear that April was less exciting. What all did you read? I would totally take a month of shouting from the rooftops about 1/3 of your reads - that's great! And, I loved In the Garden of Beasts. Another nonfiction that just came out that's getting a ton of buzz (but, I haven't read it yet) is Missoula by Jon Krakauer. Yes, all told, not a bad month! Ah, so excited you liked In the Garden of Beasts. It sounds fascinating, but also seems to be one of the more polarizing Larson reads. A lot of 5- and 2-star reviews on Goodreads, so I was a bit wary. Yes, Shannon mentioned that one below! I told her that it sounds like a book that would immediately make me angry (which isn't always a bad thing). I can't wait to see what everyone thinks of it! Your tweets made me want to do the Dewey readathon so bad. I think I'm going to try and do the October one. It sounds like so much fun! 'In the Garden of Beasts' looks interesting - looks like it should be in my TBR actually. I'll be interested to see your thoughts on it. You know, I'm almost inclined to somewhat blame my feelings about Guernsey on the fact that I read The Storied Life of A.J. Fikry so recently. I kept noticing similarities between the two, but Fikry always came out on top. Oh well—they're not all going to work, right? On the other hand, it seems like Tell the Wolves worked for almost EVERYONE I've talked to. It's amazing! Post is 80% written, just needs some more time/touching up before I send it out into the world. Look for it soon! It's kind of the best thing, Heather. You should really give it a go in October—I know I'll be there! And I'm excited to get to it. I ended up starting with Chasing the Scream and can't put it down! Looking forward to a review of Tell The Wolves I'm Home! #1 - I really liked Tell the Wolves I'm home as well. #2 - Dewey's was good...now I'm looking forward to Bout of Books. #3 - You and Julianne together? That should be a fun day. I'm jealous. #4 - Tell me how you feel about Disqus. I had it on my blog for a short period of time and liked it, but I had a pile of people unable to comment (possibly a situation with Mac users?). I want to put it back up, but don't want to alienate visitors.